Many of us now use our smartphones and tablet for playing various types of media but for those who prefer a dedicated media player then today we have news of the new Samsung Galaxy Player. 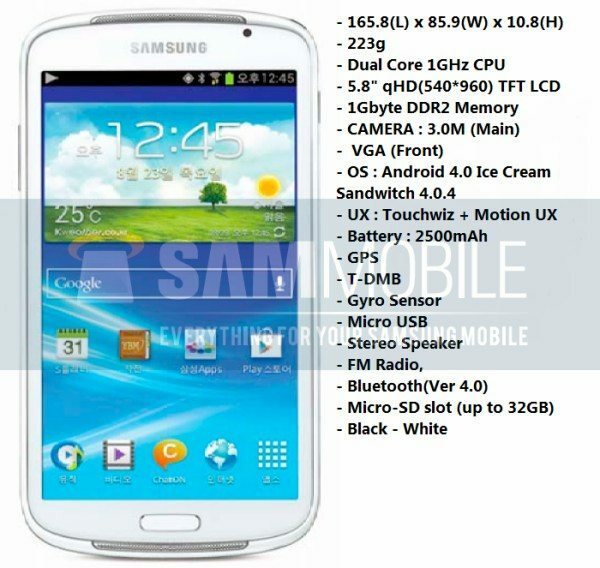 It seems as though an update to the current Galaxy Player version 5.0 could be announced as early as IFA in Berlin later this month and now leaks have appeared showing what purports to be the next Samsung Galaxy Player YP-GP1, showing that it will look just like the smash-hit smartphone, the Galaxy S3 (S III). Although the present version of the Galaxy Player was only released in the latter part of last year, if these leaks are accurate it seems that a successor could already be in the pipeline. If you’re not already aware of the Galaxy Player it’s really Samsung’s version of Apple’s iPod touch so you won’t get phone functions but you will get access to a musical database as well as apps from Google Play. The leaked specs list tells of a 1GHz dual-core processor, whopping 5.8-inch QHD display with resolution of 540 x 960, microSD slot for up to 32GB of storage, 3-megapixel main camera and VGA front camera plus a 2500mAh battery. Other unconfirmed specs include GPS, Micro USB, stereo speaker, FM radio, Bluetooth 4.0 and it runs on Android 4.0 Ice Cream Sandwich with Touchwiz. Dimensions are 165.8mm x 85.9mm x 10.8mm and it weighs 223g and will come in black or white color options. The leaked image was brought to our attention by Product Reviews, sourced from SamMobile, and as you can see, the device looks remarkably similar to the Galaxy S3 phone. We’re all expecting big announcements from Samsung at IFA on August 29 including the unveiling of the Samsung Galaxy Note 2 smartphone and hopefully we may also be hearing more details then about this upcoming new Galaxy Player. We shall, of course, bring you more details on this when we have further information but in the meantime we’d like to hear your thoughts on this Samsung media player. Do you like the sound (excuse the pun) of the new Samsung Galaxy Player? If you’ve previously favored the iPod touch could you be tempted to the Samsung player instead? returning the phone or either purchasing a couple extra batteries.